My weak performance in the book department of this challenge pales in comparison to my real failure in the movie portion. Somehow, February slipped away with only two films added to my list. Truth be told, I watched three movies. The third movie, Super 8, was a re-watch so it can’t count for the Challenge. This unfortunate situation won’t stop me from singing the film’s praises,though. It was just as good the second time around. It’s funny and sad and heart-warming with some thrilling action sequences (the train crash – WOW!) and just enough scary for the PG-13 audience. My youngest son, Ace (age 10 1/2) loves this movie and could watch it over and over. (Please know that my impression of Super 8 is not the least bit affected by the fact that this second viewing took place in the theater of Royal Caribbean’s Jewel of the Sea on our way back from Costa Maya, Mexico.) Alas, despite all my good feelings about this worthwhile movie, it still doesn’t count toward the 50/50 Reading Challenge. The two movies that do count are listed below. While both were well-done, one I would watch again and one I would not – even if I was feeling generous with my time because I was cruising the Caribbean. Contagion (2011) starring Lawrence Fishburn, Matt Damon, Jennifer Ehle, Kate Winslet, Gwyneth Paltrow, Marion Cotillard, Jude Law, (I’m sure I forgot someone) (7/50). When a highly infectious, unknown “bug” infects and quickly kills pockets of people around the world, panic and the inevitable breakdown of dependable civilization is the result. Some topics addressed by this rather difficult movie are government manipulation of the masses and the keeping of secrets, the power of the Internet, the actions of desperate humans and the people who prey on them for monetary gain, and hope in the midst of despair. The star quotient is through the roof and everyone delivers solid performances. The cinematography plays very well into the emotions of the movie – a downward spiral of despair coupled with a progressively grayer and darker visual quality. This is not an easy movie to watch. The situation is quite plausible and the human reactions are realistic and ugly. My only real issue is that so much is going on, it’s difficult to really connect on a significant level with any of the characters except maybe Matt Damon and his daughter. This was a one time only movie for me because of the depressing subject. (almost a 4/5 stars). As an interesting side note, three of the actresses in this movie played heroines in separate movies based on Jane Austen’s novels. (I can’t help it – I’m a huge Jane Austen fan.) Jennifer Ehle played Elizabeth Bennett in the BBC’s 1995 mini-series version of Pride and Prejudice opposite Colin Firth’s Fitzwilliam Darcy. Gwyneth Paltrow played Emma in the 1996 version of Emma. Finally, in Sense and Sensibility (1996), Marianne Dashwood is played by very young Kate Winslet. I also just realized that all these movies came out about the same time, too. Just a bit of trivia I thought I’d share. 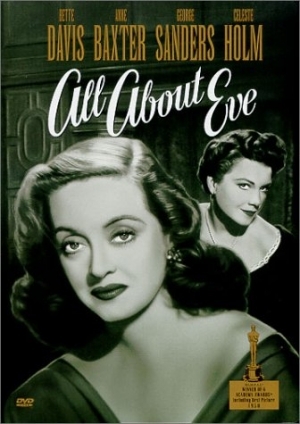 All About Eve (1950) starring Bette Davis and Ann Baxter (8/50). I never thought I would ever say this but thank goodness for piles of clean laundry that require folding. It’s my general excuse to sit down in the middle of the day and watch a grown-up movie. All About Eve was simply fabulous on so many levels. Just watching Bette Davis do her thing would have been supremely satisfying. Even so, this movie was so much more than just a vehicle to showcase one of Hollywood’s finest talents. Because the movie starts with the ending, viewers think they already know the outcome. This only creates an enhanced fascination with the characters and story line. Ann Baxter, who plays Eve, is superb as the angelic manipulator. Bette plays the insecure diva that you can’t decide if you love or hate. And, pleasant surprise, a young Marilyn Monroe plays a cameo role. I confess, the fact that the conflict comes to a very tidy conclusion filled me with happiness. Need I even mention the glamorous fashion? If folding wash grants me viewing opportunities like this, I might just roll around in the mud so I have wash to take care of. Just kidding. I think.